For moviegoers who walk up to a theater blind and choose what they’ll watch based on title alone (believe it or not, they’re still out there), “The Meddler” will seem like a comic book super villain movie. That would be a very clever way to get viewers to watch a surprisingly touching and poignant dramedy that deals with the varying degrees of grief that comes with the loss of a loved one. Audiences may be surprised how relatable the characters are in this largely autobiographical story from writer/director Lorene Scafaria (“Searching for a Friend for the End of the World“), but loss has hit all of us at some point in life and it’s easy to connect with the highs and lows that such a life-changing event undoubtedly brings. 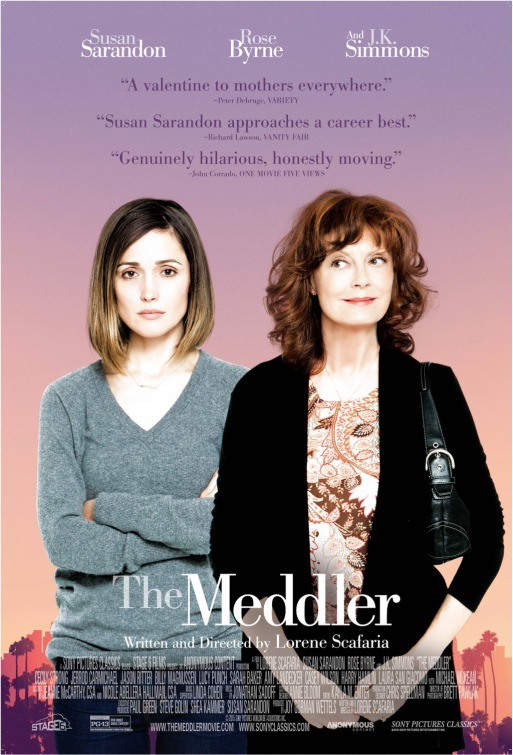 Maybe that sounds heavy for a film called “The Meddler”, with a poster that looks like a straight-up comedy, but that’s one of the many aspects I like about Scafaria’s film. Despite its flaws, it’s a film that subverts expectations and one that effectively utilizes three talented actors to their ample potential. Safari’s screenplay – which draws upon her own relationship with her mother – follows Marnie Minervini (Susan Sarandon), a Brooklyn widower who relocates to Los Angeles after the death of her husband, to be near their television writer daughter, Lori (Rose Byrne), whose still getting over a breakup with Jacob (Jason Ritter), a kind of clueless local actor. Despite her well intentions, Marnie is pushing Lori away with her endless texts, non-stop voicemails and unannounced visits. When Lori flies to New York to oversee the taping of a pilot she wrote, Marnie stays in L.A. and has to figure out what to do with her life and all the hard-earned money her late husband left her. Immediately, we learn what kind of person Marnie is, by way of what we assume is Sarandon offering narration as her titular character, as the film begins. She’s going on and on about how wonderful it is living in The Grove, an idyllic Southern California community she describes as “like Main Street in Disneyland” and how nice her apartment is (the balconies in her complex aren’t intrusive) and how amazing the nice young man was the Apple store’s Genius Bar. It’s not narration though, but rather a lengthy voicemail she’s leaving for her daughter as she drives. What Marnie sees as mere communication, Lori sees as intrusive over-information and her mother’s incessant kindness and stifling persistence is starting to wear her down. It’s not just that Marnie comes across like a stalker to Lori, it’s that there’s no escape from her Beyonce-obsessed/iPhone addicted mother. It doesn’t help that Marnie knows all her daughter’s girlfriends too – the pregnant one, Emily (Lucy Punch) and the petty ones who talk about Lori behind her back, like Jillian (Cecily Strong) and Trish (Casey Wilson) – and she talks to all of them and they all think she’s fabulous. So, there’s really no one Lori can turn to who doesn’t think her mother is the bees knees. In fact, her friends may even think Lori is overreacting. It’s obvious that Marnie and Lori love each other and there is a closeness there, but Lori clearly needs some space – or “boundaries” which is what her therapist, Diane (Amy Landecker) recommends, which Marnie responds to with unintentionally manipulative remarks of guilt (only adding to an already stressful situation) – as she strives to figure out her own identity and career. She doesn’t want to wind up in a restaurant having Valentine’s Day dinner with Marnie. Lori’s decision to head to New York is exactly what she needs and it’s also what the audience needs as well (I got a kick out of seeing Harry Hamlin and Laura San Giacomo cast as Lori’s TV dad and mom). Scafaria’s brief coastal separation of her two characters – both of whom are avatars for her relationship with her own widowed mother – allows viewers more time with Marnie, which helps because Sarandon is splendid in this role. She balances a wide-eyed naiveté and the wounded interior that Marnie hides with grace and vulnerability. The ways in which Marnie spends her time and money while Lori is gone is quite comical – I laughed out loud many times. Actually, it’s often too comical – which is primarily where the screenplay’s flaws appear. Some of her generous behavior is kind of unbelievable, and while it reinforces her need to feel needed and to make people (even those she hardly knows) happy it’s still hard to believe. That being said, there are still moments within that behavior that feels like its ‘playing for laughs’ a bit too much. For example…Marnie offers to pay for Jillian’s entire wedding, renting a yacht and the band Blues Traveller (yes, that’s John Popper on vocals and mouth harp) to play at the reception. It seems like something that would only happen in a movie and when that happens, Marnie unfortunately feels less and less like a real character that we see Sarandon convey in some of the quieter moments in the movie. She also offers to drive Freddy (Jerrod Carmichael), the twentysomething Apple store guy to and from the night school she inspired him to apply for. This seems like a benevolent gesture, but the genuineness of that friendship is derailed when Marnie gets high when she eats a bag of weed that was left in her car by Freddy’s brother, in a panic not to get caught by a cop. Now, I’m no expert on pot, but I don’t think one can actually get high by chewing and swallowing grass – but, like I mentioned, Scafaria is just concerned about the laughs here, which is apparent in the lengthy pot montage we’re then given. It’s worth a chuckle, I suppose (that is, if it made sense), but that sequence is just cruising for some mileage. On that note, it seems like there has to be a marijuana scene in every ‘over sixty-something’, female-driven dramedy within the past year. Lily Tomlin’s “Grandma” and Blythe Danner’s “I’ll See You in My Dreams” comes to mind. Except for “Grandma”, the inclusion of such a scene feels forced. Not that I doubt seniors are toking up, it just tends to take us out what’s really going on with the characters – and again, aiming at pure laughs. 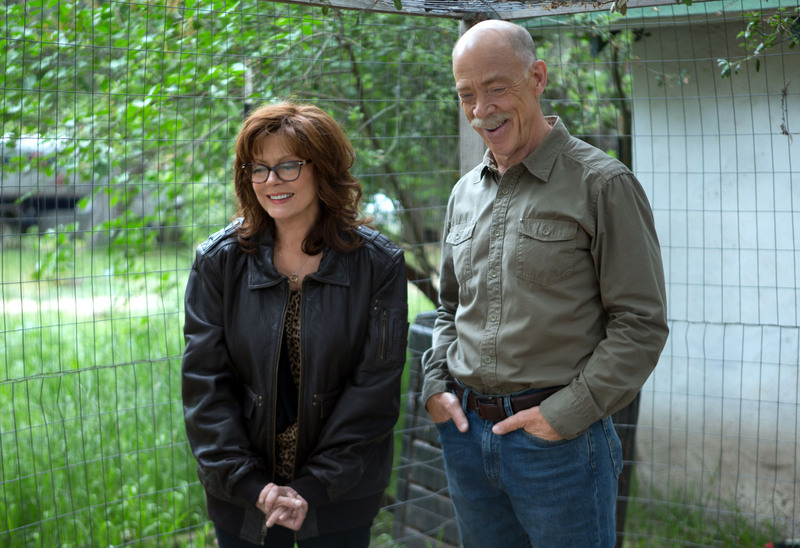 At least Marnie’s tango with Mary Jane finds her bumping into a former-cop named Zipper ( the always great J.K. Simmons, in a Sam Elliot role) – his first name is Randy, but “my friend’s call me Zipper”. She caught his attention earlier in the film, on a film set where she inadvertently become an extra – a truly comical scene – where he was working security. It’s a good thing too, since the flirtation between Sarandon and Michael McKean‘s persistent Brooklynite character feels too forced. 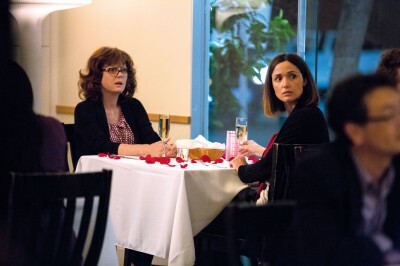 Simmons’ character is one of the few embellishments from Scafaria’s real life – call it a wish-fulfillment for her mother – and the interaction between Sarandon and Simmons is needed. As formulaic as it is, it grounds the film with a comfortable and relaxed chemistry. Zipper is exactly what Marnie needs – a straight-shooting, kind-hearted soul who isn’t above taking her advice (“call your kids!”). Simmons’ Zipper patiently wears down Marnie’s obvious anxiety about another man in her life, much like Elliot did with Danner’s character in last year’s “I’ll See You in My Dreams”. Come to think of it, “The Meddler” could be a pleasant companion piece to “Dreams”. Both deal with different forms of grief, although Scafaria’s film covers the subject in a more prominent manner. Which is good, since grief is a subject that needs to be covered in cinema. It’s a subject that many cultures handle in a variety of ways, but Americans have a tendency to gloss over it, thinking it will go away. It doesn’t – any form of it: death, divorce, miscarriage, abortion or getting laid off – you name it. They’re all forms of grief. Both Marnie and Lori are still greatly affecting by the death of their husband/father and it may take a while before the two of them can see it, but as survivors they have to come to terms with their loss in their own individual ways. Everyone has that family member who offers unsolicited advice and never-ending input. I’ve found it’s usually a female nurturing type, like a mother, grandmother or aunt (or the “in-law” equivalent) who tries to solve what they perceive as problems when all you want to do is just share your feelings or simply be left alone. But being left alone doesn’t compute for these overbearing nurturing types, who are often master manipulators without even knowing it and, of course, as the title states, meddlers. It’s great that there’s a film made revolving around a 69 year-old actress. Sarandon isn’t playing an old maid or a granny, thankfully. She’s playing a woman whose love language is nurturing (albeit to the point of smothering) and buying things for others, someone attempting to (yet hesitant to) reinvent herself now that she is widowed and her daughter apparently needs her less. That’s characterization that can pull in any viewer, especially in the capable hands of an actress of Sarandon’s caliber. I used to think it was nuts for small budget independent films to come out right around the same time certain movies are dominating the box office, which is something that’s hard to avoid now. “The Meddler” hits theaters between the release of two Disney behemoths, “The Jungle Book” and “Captain America: Civil War” – but I’ve come to realize that dramedies like this one offer a welcome alternatives to moviegoers that are tired of more of the same. Sure, those big-budget movies have a built-in audiences can be legitimately good in and of themselves, despite what audiences come to expect from them. A film like “The Meddler” offers a more relatable viewing experience and will even provide delightful surprises. You will see yourself and/or someone you love as you watch it. “The Meddler” may get lost in the mix of all those blockbusters at the multiplex right now, but it shouldn’t. I believe there’s an audience out there that can and will connect with it. I certainly would take my mother or someone else’s to go see it.